Industrial lighting specialist Larson Electronics has announced the release of a new 18 watt LED light fixture constructed for industrial use and approved for outdoor environments. This powerful LED light produces 1,530 lumens of light, operates on 120 to 277 volts AC, features an adjustable trunnion mounting bracket, and is available in a variety of configurations to allow tailoring to the specific requirements of various applications. The housing on this unit is constructed of precision machined aluminum for excellent strength and durability; powder coated for corrosion resistance, and is IP65 rated for ingress protection against direct exposure to water jets from all directions. This LED light is equipped with an impact resistant polycarbonate lens for increased safety compared to glass lenses. An adjustable trunnion mount in the center of the light housing allows this unit to be fully adjusted after installation, allowing for precise aiming of the light. This 18 watt industrial LED light is offered in a focused 25° spot beam for distance or 60° flood beam for a diffused wide angle beam. This light provides a cool white light output with a color temperature of 5000K and a color rendering index of 85 for maximum illumination. This LED light is equipped with twelve inches of SEOOW cable with flying leads. These lights are universal voltage and can be operated on 100-277 volts AC. This unit is also available in 11-25 volts DC for applications requiring low voltage operation. 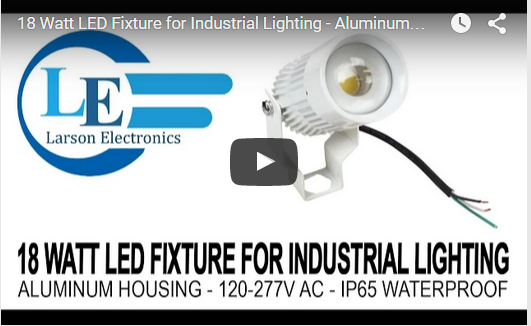 This light is ideal for indoor and outdoor applications and industrial operations where wet conditions are commonly encountered. carries an extensive line of explosion proof LED lights, LED work lights, light towers, intrinsically safe LED lights, portable work lights and industrial grade LED area lights. You can view Larson Electronics’ entire line of industrial grade lighting by visiting them on the web at Larsonelectronics.com. You can also call 1-800-369-6671 to learn more or call 1-214-616-6180 for international inquiries.